Well | popped into the small Marks and Spencer Food Hall located at Birmingham New Street with my heart set on Limited Edition goodies. As previously mentioned the Halloween items seem a rehash of last years, which is the same for many shops and brands this year. Christmas though has quite a few new exciting items, and Marks did not disappoint On this occasion I picked up these crisps and a couple of bags of chocolates which I’ll be writing about later in the week. The items were noticed by the cashier on the counter who teased me when he spotted the Christmas theming, I defended my choices and said it was never to early in the year for Christmas novelty, in my head. 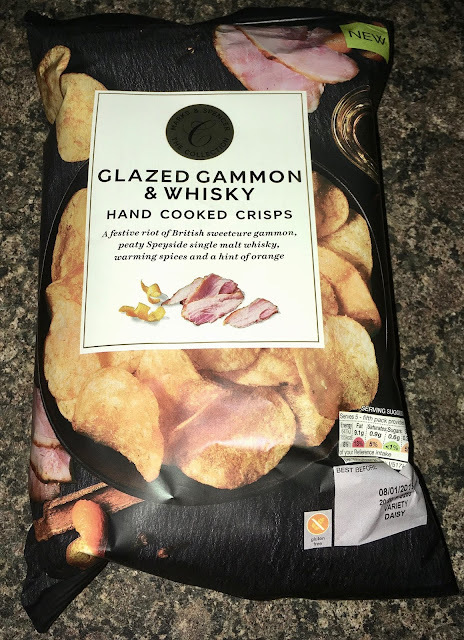 These crisps are flavoured with Glazed Gammon and Whisky, and so are perfect for a posh night in or sharing with friends. We tipped some into a bowl to have with lunch, a bit more down to earth for such a middle class sounding snack. The crisps have a nice crunch, while not being too hard. The flavour was wonderfully meaty and I liked the rich ham and gammon tones. The whisky adds a nice depth of flavour, and there is a nice after taste of orange and spices. 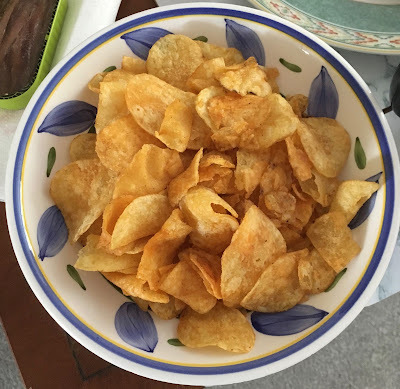 The crisps worked surprise well and managed to capture the complex flavour fully. They did remind me of a spiced gammon joint, and as that is something we only buy at Christmas. They are perfectly seasonal, just perhaps not in October for everyone. Yum - definitely want to give these a try this year. I didn't like the prosecco ones they did last year (or was it the year before?) but these sound much more like my kind of thing!